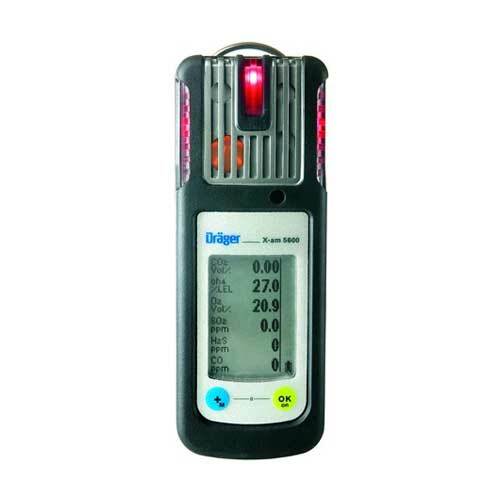 Featuring an ergonomic design and innovative infrared sensor technology, the Drager X-am 5600 is the smallest gas detection instrument for the measurement of up to 6 gases. Ideal for personal monitoring applications, this robust and water-tight detector provides accurate, reliable measurements of explosive, combustible and toxic gases and vapors as well as oxygen. SMALL YET ROBUST - Small, light and easy to use - the robust and water-tight Drager X-am 5600 is designed for single-handed operation in tough industrial environments. Water- and dustproof according to IP 67 and with an integrated rubber boot, the device provides optimal functionality even under harsh conditions. DURABLE INFRARED TECHNOLOGY - Thanks to the high stability and a resistance to contamination, Drager infrared sensors can generally be used for up to eight years. This advanced technology reduces the cost of ownership considerably because less replacement sensors are needed. In addition, a sensor calibration is only necessary every 12 months which reduces maintenance costs. SINGLE OR DUAL SENSOR - ACCURATE MEASUREMENT RESULTS - The new Drager infrared sensors can be used for the measurement of explosive substances or CO2: The infrared sensor IR Ex allows the measurement of explosive, combustible hydrocarbons in the range of the lower explosive limit. With this sensor, measurements in the range of 0-100 Vol.-% for methane, propane and ethylene are also possible. The infrared sensor IR CO2, with a measurement resolution of 0.01 Vol.-%, provides safe and exact measurements as well as a warning against toxic concentrations of carbon dioxide in the ambient air. For those applications where the reliable measurement of explosive substances and CO2 is specifically needed, the advantages of both can be achieved by a dual sensor (Dual IR CO2/Ex). ALSO IN COMBINATION WITH HYDROGEN - Besides hydrocarbons, hydrogen can also be an explosive gas. Because sensors based on infrared technology do not warn against hydrogen explosion dangers, the Drager X-am 5600 combines two sensor signals (Infrared Ex and electrochemical H2) for reliable hydrogen detection. The X-am 5600 provides the advantages of poison-free technology to be used in areas where, until now, only catalytic Ex sensors have been used. VARIOUS MONITORING POSSIBILITIES - Thanks to the combination of innovative infrared technology and the latest electrochemical Drager XXS miniature sensors, this 1-to-6 gas detector reliably detects explosive, combustible and harmful concentrations of O2, Cl2, CO, CO2, H2, H2S, HCN, NH3, NO, NO2, PH3, SO2, Amine, Odorant, COCl2 and organic vapors. With the PC software Drager CC-Vision, the sensors can easily be exchanged, calibrated orconverted to meet the needs of different applications. FLEXIBLE USE - This small gas detection instrument is perfectly suited as a personal monitor. The simple two-button control panel allows for the intuitive use of the device. The gas inlets - on the upper and front side - provide optimal measurement accuracy even if they are inadvertently placed in a pocket or a gas inlet is covered. An optional external pump which can be operated with hoses up to 20 m or 65 ft. in length is the perfect solution for pre-entry measurements in tanks or pipelines. To monitor entire areas, the Drager X-am 5600 can be used in combination with the innovative Drager X-zone 5000. SUITABLE FOR EX ZONE 0 - The small and reliable gas detector is suitable for use in areas classified as zone 0, which are areas where explosive atmospheres are always to be expected. SIMPLE SOLUTION FOR BUMP TESTS - Simple, quick, and professional: From bump testing to complete documentation, users can choose from a range of practical, on-site solutions for optimal safety in every application. Both the Drager E-Cal automatic test and calibration station and the Drager Bump Test Station are ideal system extensions that save costs and time.